Health experts say you should get your flu shot before the end of October. Flu season is coming and doctors say it takes a few weeks for the vaccine to boost your immune system. LOXAHATCHEE, Fla. — Health experts say you should get your flu shot before the end of October. Flu season is coming and doctors say it takes a few weeks for the vaccine to boost your immune system. During the 2017-18 peak flu season clinics and pharmacies were running out of vaccines, flu tests and even Tamiflu. This year doctors say the best way to prevent being impacted by any possible shortage is to get your vaccine early. 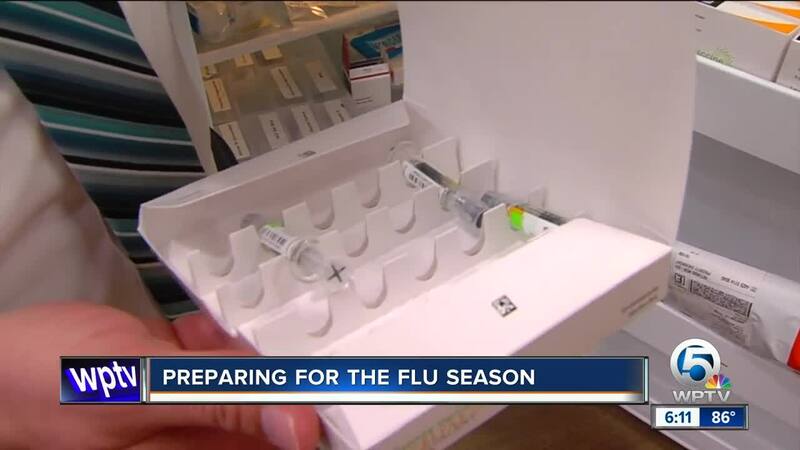 "It does take a little time for it to boost your immune system to respond to the actual virus so we recommend ... to get the flu vaccines at least two weeks prior to the start of flu season," said Dr. Kyle Petersen, American Family Care Medical Director. There are two vaccines available: the quadrivalent, which covers four strains of influenza and is recommended for anyone six months and older, and the trivalent, which is a high dose vaccine that covers three strains and is recommended for anyone 65 and older. The Centers for Disease Control has also re-approved a nasal spray vaccine. "It's very early to see this, but we have had already two or three outbreaks here in Palm Beach County, most of those are at senior homes or adult living facilities," said Timothy O'Connor, a public information officer with the Florida Health Department. O'Connor said people should be getting their flu shots now. The season starts November 1. "It's a long involved season, it's a good six months," he said. The health department said insurance companies do cover the flu vaccines. You can get a vaccine at your primary doctor's office or any pharmacy clinic or urgent/family care center.